to keep your audiences screaming - with laughter! Richard Paul is a clean, family friendly comedy ventriloquist who brings to life his stage full of colorful, outrageous characters. His fast pace, funny improvisational style, and audience interaction is an unforgettable comical experience. 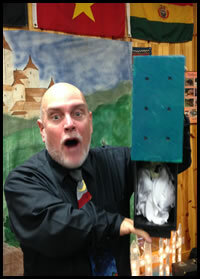 He is recognized as one of the best clean banquet entertainers, corporate comedian, and funny family performer. Richard has the unique ability to entertain and generate non-stop laughter from audiences of all ages. This non-scary, ghoulishly funny, spectacular autumn show includes life size puppets, magic, music, awesome special effects and hilarious audience participation. 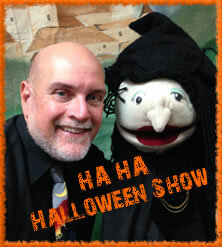 For more than twenty years Richard Paul has astounded audiences when he carries on a three person conversation with his lovable Halloween friends, Headlee Lamar, an unusual animatronics puppet and Wanda, the cute, silly, self-centered witch. "My kids are still wondering how Headlee's mouth moved when you weren't touching him." Jaws drop when one lucky volunteer and the entire audience mix together some ghostly magic with hopes of creating a "scary" puppet, but instead they produce an hysterical rubber chicken with an Elvis hair cut. "Glorpy" a lovable character shares his love for C-A-N-D-Y while at the same time promoting a safe Halloween. 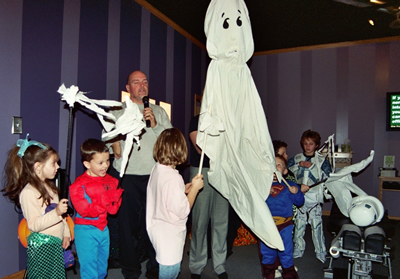 As a grand finale, selected audience members join Richard and his friend "boolardo" singing some ghostly funny Halloween songs. "Thank you so much for entertaining the seniors at Meadows of Southgate II. I heard many good remarks about your performance. They laughed during the show and even after the show. I heard some of them questioning what you named the skull in your act, and after many laughs they remembered." A Memorable Halloween show that is an unforgettable hauntingly good time for ghouls and goblins of all ages!